Here's some visual instruction links. 'Bowhunting success is dependent on the path you take and how prepared you are whilst on that path.'..... me. good helpful links there dale! What a top little lesson! I never worried about DP's as I never understood them. Now I have a better appreciation for other hunters perspective. Came across this today in my old files. 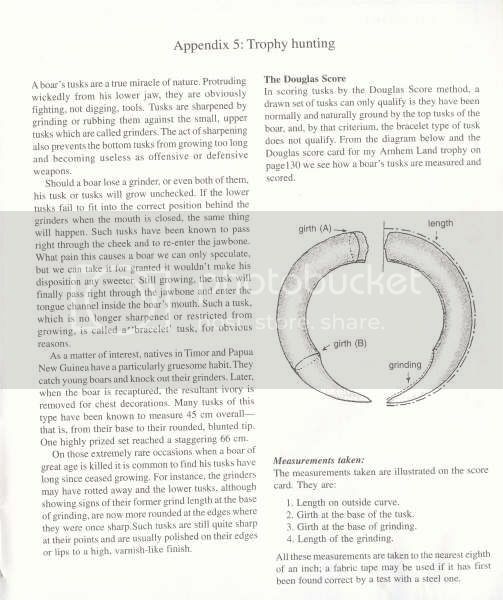 When measuring - given that some tusks I have tend to be asymmetrical - do you take the measurement from the bigger or the smaller one - or do you do both? My memory is that you take the shortest from each one and double it.